The Broadway Hotel, Llandudno, Conwy County hotels with instant confirmed online booking. We have Hotels throughout Conwy County , Wales . Accommodation near all the attractions, places to see and things to do.......You are able to make an instant secure confirmed online booking. We also offer information on Airports, and travel and tourist information. 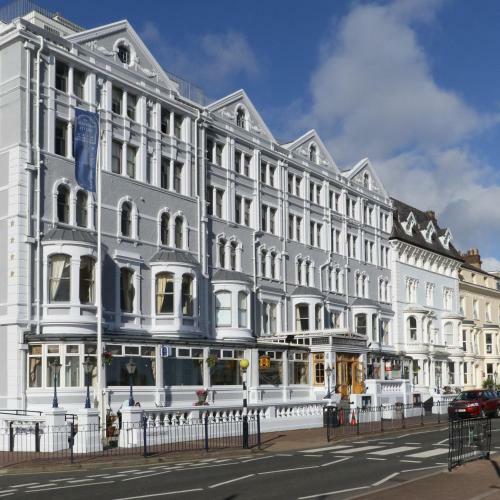 This central budget hotel is on the edge of Llandudno town centre and 200 metres from the seafront. Venue Cymru and Llandudno rail station can both be reached within a 5-minute walk. A flat-screen TV, en suite bathroom and tea/coffee making facilities are featured in each room at The Broadway. Free Wi-Fi is available for 1 hour in the hotel\'s public area\'s and most but not all bedrooms. Local produce is used to create a hearty full cooked breakfast and a wide choice of modern and traditional dishes which are served in the restaurant. A table reservation for the hotel restaurant is required prior to arrival. To request this, use the Special Requests box when booking. Pets can be accommodated in some rooms but not in Superior Rooms. They must not be left unattended in the rooms. If you are planning to bring a pet, please inform the property in advance, using the contact details found on the booking confirmation.